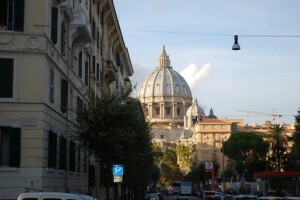 Ireland’s newest Catholic college has completed its inaugural year and first year students of Newman College Ireland held their classes in Rome. Former MEP Kathy Sinnott told CatholicIreland.net that fourteen students attended lectures from September 2014 to April 2015, initially at a block at St Peter’s Basilica, and then in the Spring term they moved to the newly refurbished Thomas More College Rome campus on the outskirts of the Italian capital. Students heard about Newman College Ireland though word of mouth, a workshop at the Youth 2000 summer fest, other events, leaflets and a website, she said. The students, mostly school leavers aged 17 to 19 with a few in their twenties, have now completed the first year in a four-year BA in the liberal arts, including courses in philosophy, theology, history, literature, mathematics and natural science. “The ethos and the idea behind the creation of the college really appealed to me,” wrote one first year student, Joseph Denniece. According to Dr Nicholas Healy, one of the co-founders of Newman College Ireland, the course will be accredited by Thomas More College (TMC) of Merrimack, New Hampshire. The college will recognise the courses and allow them to count toward a TMC degree. Moreover, NCI (Newman College Ireland) is in the process of making an arrangement with TMC such that all the courses taught in Ireland (North and South) will be accredited through TMC,” he told CatholicIreland.net. According to Dr Healy, a President Emeritus of Ave Maria University in the US and a former Vice President of Franciscan University of Steubenville, most of the financial support for NCI has come from ‘Friends of Catholic Education in Ireland, Inc’, an American charity of which he is the CEO. Already they have raised €500,000 in America for Newman College Ireland, which is in the process of achieving charitable status in the Republic. Once it attains charitable status “there will be an effort to solicit donations through an updated web site,” he said, adding it would be a “continuing challenge to raise the necessary funds”. For the 2015/2016 academic year, NCI will be based at the Drummond Hotel in Ballykelly, Northern Ireland while the college continues its search for a permanent site in the Republic. Asked about the result of the recent referendum on marriage, Dr Healy said there were two different reactions to the result. Dr Healy said that his role in Newman College Ireland was as advisor and fundraiser in the US, and he also acts as a liaison between Newman College Ireland and Thomas More College. Board members of Newman College Ireland include former MEP and disability rights campaigner, Kathy Sinnott, Professor Ray Kinsella of UCD and author John Waters.